The Polish pianist and composer never lived to see his interpretation of The Merchant Of Venice see the light of day, but it’s now alive and kicking thanks to the WNO. Most people will remember Andre Tchaikowsky as the Polish pianist who bequeathed his skull to the Royal Shakespeare Company for use in the graveyard scene of its productions of Hamlet (David Tennant was the first to display it). That much is true, but there is so much more to this ardent Shakespeare lover than that mere anecdote. Tchaikowsky found eventual haven in Cumnor, Oxfordshire, not far from his beloved Stratford-upon-Avon. Born into a Jewish family in Warsaw four years before the outbreak of the Second World War, he was relocated with his mother into the Jewish ghetto, from which he escaped with his grandmother in 1942. And by this time they had changed his original surname from Krauthammer to Tchaikowsky, on the assumption that it sounded more convincingly Slavic. After the war his career as a concert pianist developed, though not without its spiky aspects. He was rude to patrons, he didn’t bother about good relationships with conductors and orchestras, and if he sensed audiences weren’t fully attentive and appreciative he would punish them with an encore of the complete Bach Goldberg Variations (poor Bach). Andre Tchaikowsky had long been drawn to England, much attracted by the aspirationally genteel way of life described in The Diary of a Nobody (George and Weedon Grossmith), and of course with the perennial allure of Shakespeare. And here at last he was able to settle to a love perhaps greater than pianism, the ability to devote himself to composition. Works in many genres came from his pen, but his magnum opus was The Merchant of Venice, a Shakespearean opera perhaps particularly special to him through his own Jewishness and homosexuality, and one whose composition occupied him for 25 years, and which was all but complete at his death in 1982. There is anguished documentation of his attempts to secure performances at English National Opera and New York’s Metropolitan Opera, but these came to nothing, and Tchaikowsky died disappointed. It was not until 2013 that Tchaikowsky’s Merchant of Venice saw the light of day, at the lakeside Bregenz Festival, and this is where Michael Barry takes up the story. Michael Barry has for decades been a major mover in the life of Birmingham’s dramatic scene, whether as actor, director (not least at the Crescent Theatre), choreographer, or as teacher, both in schools and at Birmingham Conservatoire. “In 2011 I was associate director to Keith Warner for Andrea Chenier at Bregenz. Keith and David Pountney had, for a long time wanted to take Merchant off the shelf, where it had languished since the 1980s. We discussed it at length. Michael goes on to tell me about the Bregenz premiere. “We were aware that we were presenting this piece in Vorarlberg, at the time the most right wing area of Austria and that the content and the staging might be uncomfortable. The audience and critical response was marvellous, thankfully. “The music is contemporary certainly, but not of the squeaky-gate school by any means. This Tchaikowsky also likes a good tune and the score is full of musical jokes – as Portia hands Bassanio a ring we get Wagner’s potent curse – and what one might call filmic underscore. What effect has rehearsing The Merchant of Venice had upon the performers? “Lester Lynch, who sings the most wide and varied repertoire, says Shylock is the most difficult role he performs. Musically it is tricky, no more so than Britten say, but that aside he has to find the will to want to kill Antonio, lose his daughter and be derided and jeered at. That said he loves performing the role and has tried really hard to get out of being at La Scala for one night to perform in Birmingham. “Sarah Castle who plays Portia knew of the role from the play and thought of her as a sympathetic character. In the opera the aspect – which is there in the play – of her own persecution of Shylock is more strident. Having won her point about the pound of flesh, Portia goads and eventually destroys Shylock. “Keith’s view is that as a woman in a man’s world she has to be tougher than the men (the Thatcher argument) and that the piece, dealing with it does with prejudice, has no really sympathetic characters, which allows us to have sympathy for Shylock. 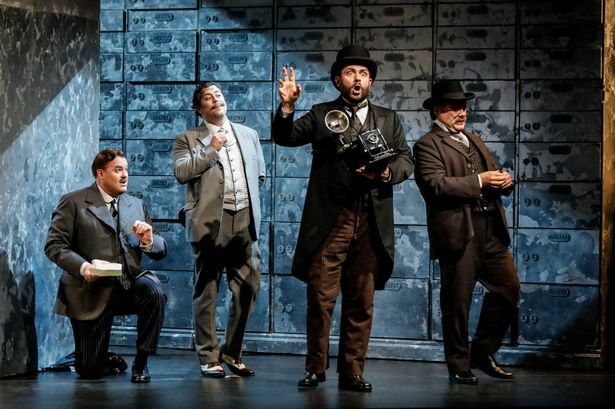 * The Merchant of Venice is performed by Welsh National Opera at Birmingham Hippodrome on Tuesday, November 8 (7pm).